The Wolves have lost six straight games to Toronto and its star forward, DeMar DeRozan. The Timberwolves (18-20) are in Toronto to play the Raptors (19-18) tonight at 6 P.M. CST. The game can be seen on FSN or NBA League Pass or heard on WCCO 830 AM. The Air Canada Centre (ANGLO SPELLING ALERT!) has been a house of doom for the Wolves: Minnesota has lost its last nine games in Toronto. Being unable to beat Toronto on its home floor is a trend that needs to end. Coming off of a bad loss against Sacramento on Wednesday at home, the Wolves need a win in a bad way. Defeating the Raptors on their home floor would help Minnesota claw back toward .500 and could help the Wolves exorcise their Air Canada Centre demons. In short, there’s a lot to like about what’s happening in Toronto. Trading Rudy Gay: Addition by Subtraction? The Raptors have hit their stride since trading Rudy Gay, who tortured the Timberwolves en route to 33 points in Wednesday’s loss to Sacramento. Toronto was 7-12 before the trade. Since the trade, the Raps have gone 12-5. With Gay, Toronto had a net efficiency of -0.3, scoring 101.4 points per 100 possessions while giving up 101.7. Since the Gay deal, that mark has jumped into the black, sitting at 6.3. The team is scoring 103.9 points per 100 possessions while holding opponents to just 97.6. With Gay on the roster, the Raptors had the bulk of their possessions used by two players, Gay and DeMar DeRozan. DeRozan has still put up a team-high 28.7% usage rate since the Gay trade, but the rest of the team’s possessions are being distributed more evenly. Center Jonas Valanciunas has taken on a bigger role in Toronto’s offense, and his play contributions to the team during their recent hot streak have been vital. The main beneficiary of Gay’s absence on the Raptors has been second-year guard Terrence Ross, who has seen his playing time skyrocket. He was playing 18.9 minutes in the first 19 games of the season, and that number has jumped to 30.2 minutes a game since the Gay trade. His production has spiked as well since being given the opportunity to play, especially from beyond the arc. Before the trade, he was shooting 34.5% on 2.9 three-point attempts a game; since the trade, he’s shot three more times from long range a game (5.9 attempts) and his efficiency has ballooned to 46.1%. There’s much more on the Raptors’ trajectory since the Rudy Gay trade here. Well, the Wolves held Boston to just 88 points, won by 18, and gave the fans a win that was mostly enjoyable to watch. Despite some first-half struggles from the Kevins, the Wolves used a combination of transition offense, J.J. Barea Hero Ball, and Nikola Pekovic glass eating to take a five-point lead after two quarters. In the second half, Kevin Martin calibrated his three-point range (he was short on just about everything in the first) and Kevin Love showed off hook shots while also grinding out foul-draws to the tune of a workmanlike 23 points and 12 rebounds. The 7 turnovers on his line are evidence of some of his struggles in this game. Robbie Hummel advanced the “positive correlation guy” narrative drum that I’m beating, with 8 points in 20 minutes of (+14) basketball. On defense, Adelman said that they wanted to make Boston a jumpshooting team. They pretty much succeeded at this. Early on, those jumpers went in. Later on, they didn’t. The lead grew and the Wolves cruised to a comfortable win. This team seems like a good front runner. Let me get back to Pekovic for a moment because I think his performance gets to a bigger-picture issue with this team. With Ricky Rubio being such a non scorer (3 points combined in the two games this weekend) and nobody on the team possessing elite shot creating in the traditional mold of a LeBron/Melo/Wade/Kobe nature, I think one of the keys on nights like last night is to pound the offensive glass. There will be games like this one (the Cleveland loss was a good example) where the offense sputters and they’ll need an alternate route to points. Pek had 8 offensive boards last night and scored 20 points on 8-9 shooting. Most of these were putbacks. As the Wolves continue to refine their offense — currently the league’s 9th best — the challenge will be to maximize all of the immense talents of Rubio, Martin, Brewer, Love and Pek. In the early part of this season, Pek seemed almost like an odd man out, often losing shot opportunities to aggressive bucket hunters Love and Martin. One way he can unquestionably add value is to do what he did last night and crash the boards. After his huge game last night, his offensive rebounding percentage is up to 11.1 percent. Last season’s was 13.1 percent. It’d be nice to see him focus on getting back to this one skill that will be hugely important, particularly if Rick staggers his bench rotations like he did over the weekend, pairing Pekovic with Barea. J.J. is certain to create “Kobe Assist” opportunities with his kamikaze drives that usually draw an extra defender and often times clank off the rim. All in all, a solid win over a bad team. Adelman emphasized after the game that good teams MUST win at home. He said that you then try to split on the road. Taken literally, he’s describing a path to winning three fourths of regular season games. While that’s a bit optimistic for this team (it’d be 61 or 62 wins, which even the most optimistic would be impressed by) it’s clear that Rick expects to win this season. In a comment yesterday, I said the Wolves hadn’t really owned a game since their last victory over Houston. They broke that streak Friday night, again against the Rockets, in a 111-98 victory in Houston. 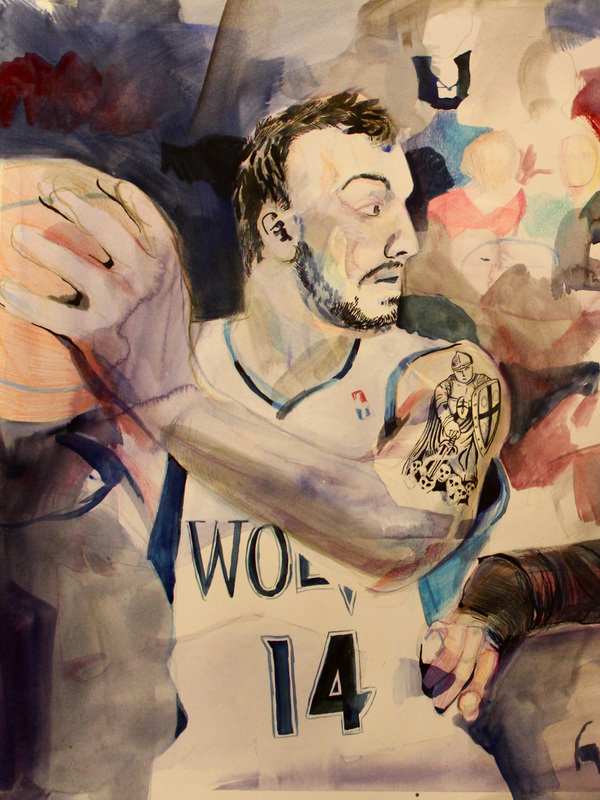 Nikola Pekovic and Kevin Love were the big stories. The early season narrative for the TWolves has been that Ricky Rubio and Kevin Love are amazing players who need some help. Other starting players, most notably Wesley Johnson and Darko Milicic, have failed to provide meaningful production or consistent play that breeds any confidence in the two stars’ supporting cast. Michael Beasley led last year’s team in scoring per minute (21.4 per 36; 19.2 per game) but didn’t make himself many fans after ankle sprains on each leg derailed what looked like a promising season. In 73 games, he surpassed 30 points 8 times, and 40 points once. But the way he scored those points, often isolation sets with some ball-stoppage, isn’t popular or always fun to watch. Also, and much more significantly if we’re being fair, his defense was often times lazy and always incoherent. A plausible retort to this would be that he was simply “joining the club” of Rambis-coached wings who had no idea how to rotate defensively. Beasley had serious flaws to be addressed if he were going to be an impact player on an up-and-coming team led by Rubio and Love. This season, some fans and analysts expected a breakout year from Supercool Mike, both because of Rubio’s playmaking but more so because Rick Adelman would devise schemes to get him the ball closer to the hoop. A problem with the Rambis triangle was that it often resorted to clearing out for Mike 24 feet from the basket for everyone else to stand and watch. This wasn’t good for Mike’s efficiency or the Timberwolves win/loss record. In the early going this year, he showed flashes of improved play. His defense was been better. Night and day. He’s played respectable defense on LeBron James, Kevin Durant, and even Kobe Bryant. If you watched Wellington try to guard Kevin Martin (or if you remember the days of Shaddy McCants trying to defend Baron Davis or LBJ) you’ve seen an outmatched defender in a Wolves uniform. This is not Michael Beasley. If he’s focused and coached, he’s an adequate-or-better defensive wing. His shot was colder than we’ve ever seen it in the early going. He put together stinkers of 11-27, 2-6, 5-16, and 4-12 before spraining his foot and missing the next 11 games. It should be noted that the Wolves were probably playing their best basketball in that early going against a brutal schedule. They trounced the Spurs and Mavs (with Dirk, unlike the second time they beat them without Mike) and held late-game leads on title-favorites OKC and Miami. But Mike needed his shot to fall like it used to before things could really take off for he and the team. Of course, the schedule weakened right around the time of the injury and the team ripped off an 11-game stretch of over-.500 basketball, going 6-5. THEY’RE BETTER WITHOUT BEASLEY! LOOK AT THE BALL MOVEMENT! Only, if you watched the Toronto or Atlanta games, you saw what happened against a respectable foe when the game slowed down and shot creating became a necessity. 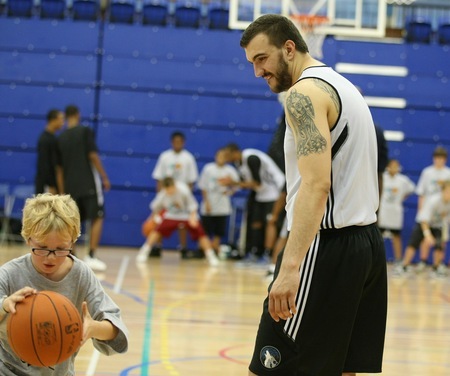 The Wolves have exactly one shot creator on the team, and he was sidelined for those games. You might also look at those 6 wins and notice that they came against either garbage competition (Wizards, Hornets, Kings, Pistons) or good teams that were without future Hall of Famers (Clippers without Chris Paul, Mavericks without Dirk Nowitzki). The record was inflated by an easy schedule. Despite what some desperately wanted to believe, the team was NOT better without its best scorer. Fast forward to tonight’s game at Houston. The Rockets (who recently spanked the Mike-less Wolves at Target Center) held a mighty 9-2 home record heading into this game. Minnesota had no rest, traveling overnight into Houston after a hard-fought loss against LA. Houston rested last night in their beds at home. This was not a game the Wolves should have won. Oh, but they did win, and they pummeled the Rockets behind Mike Beasley’s 34 points on 14 shots. Mike had his jumper going, his dribble penetration game going, and he was getting to the line where he hit all 12 attempts. His monster scoring performance led the way in this one, increasing the lead throughout the second half. The Ricky & Love show became a Minnesota Big 3, as Rubio damn-near f’d around and got a triple double (18 points, 11 assists, 8 rebounds) and Love added 29 & 7 of his own. Is Mike going to score like this every night? Of course not. But he will some nights, and on those nights Minnesota will be almost unbeatable. When he’s clanking shot after shot? Sit him down, or watch Kevin Love collect rebounds. Beasley draws extra defenders, a skill that doesn’t show up in a box score but is essential to consistently-successful offense in the NBA. He also complements the team’s best players by adding a skill that neither possesses: a dominant one-on-one game that will foul out opponents, allow teammates to get some rest on offense, and challenge opposing coaches into lineup decisions they might not prefer. I hope this isn’t a one-game fluke, and an amazing coach like Adelman can draw as much of Beasley’s natural talent as is possible. He’s a restricted free agent this off-season and the forward duo lauded by John Hollinger last year could be really something, especially with the Spanish floor general leading the way. * Martell Webster’s feisty defense in the second quarter turned the game. He plays D on a slightly-different level than his teammates. Watch a Memphis Grizzlies game for comparable effort and approach. This is an asset, for sure, especially from a guy that the team can afford to get in foul trouble (because he will, if he plays this way). Webster should be the starting shooting guard very soon. Let’s all hope his back stays healthy. No more of these. * Derrick Williams is frozen out of the rotation. TRADE DERRICK WILLIAMS will become a common meme. That could be wise, depending on the deal, but let’s not lose sight of the talent here, and how similarly-awesome college players with talent took their licks en route to NBA improvement. James Harden and Evan Turner took time to adjust, as Williams will. Biggest reasons for NOT trading him: (1) He’s on the rookie scale; and (2) He’s insurance against Love getting injured or Love bolting after 3 years. If he continues to improve as a power forward, and he will, those are not insignificant factors. A shooting guard can be signed in free agency this off-season, if need be. * Kyle Lowry versus Ricky Rubio could be an All-Star debate in the next few years. Lowry bested him at Target Center, and Ricky took this match. Very different players. Very good players. For a recap of tonight’s one-sided loss to the Houston Rockets, click here. For even more detail, click on any number of the excellent blogs in the right column. For some observations, questions, and ramblings from a frustrated fan who sat through the entire game, see the following. Kevin McHale’s Rockets are now 10-7. If the season ended as I write this, they’d be the 8th seed in the Western Conference Playoffs. One season ago, the Rockets were not a playoff team under the Wolves’ heralded coach, Rick Adelman. No knock on Adelman. But Kevin McHale might be a decent coach. 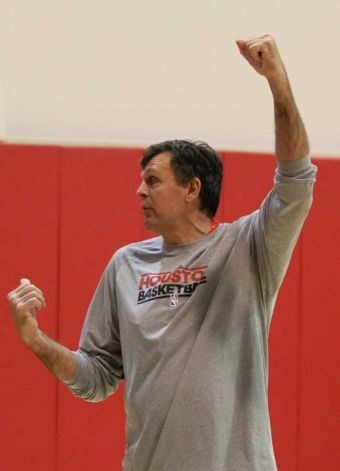 McHale’s squad oozes confidence like his Wolves teams did in that middle part of the 2008-09 season, post-Wittman, pre-Jefferson injury. For an entire month, Mac led that talentless group to the best record in the NBA–not too shabby. Kyle Lowry is playing particularly well under McHale. Kyle messed around and got a triple-double against the Wolves, dropping 16, 10, and 10 and giving Ricky Rubio fits in the process. You could say he had a Good Day (NSFW depending on where you W). Did I ever think I’d miss Wesley Johnson? No. I’ve spent most of the season wondering how much better the Wolves would be without him. I’m trying to square that with what happened tonight, when dream became reality. Wayne had an EMBARRASSING night. Martin ran him off of screens, spun him in circles, drew fouls, and buried jump shots. All. Night. Long. K-Mart had 21 at the half and made it look oh-so-easy. Parents with aspiring ballplayer kids should have them watch Martin move without the ball. Just don’t let them watch him shoot–that unconventional and ugly stroke works for one guy and one guy only. K-Love was 5 for 5 from downtown tonight. He had 39 points. He shot 13 for 19. Love should shoot as many threes as he possibly can. In fact, Love should emulate the one PF in the league who gives him matchup problems–Ryan Anderson. Anderson is shooting 9.1 3PA’s per 36 minutes (compared to Love’s 4.7), and rocks a 24.9 PER. Not bad for the 21st Pick in the 2008 Draft. Love’s foul-drawing and rebounding are huge parts of his game, but he is noticeably-hesitant to pull the trigger on 3s. Not as much in tonight’s game, and 39 points later, I hope he builds on a great scoring night. I won’t lie: I hate the way Kevin Love tries to draw most of his fouls. He isn’t making basketball plays. He’s wrestling–sometimes without any hope for a real play–and he gasps in disbelief when refs DARE not to call a foul. Meanwhile, the other team is often running out for a secondary or primary break. There are good ways to draw fouls. LeBron James ATTACKS when he draws fouls. If a foul isn’t called, a shot goes up that might actually go in. He might dunk over somebody. He might find a shooter for three. But when Love’s antics don’t work, at best he retains his balance and finds a playmaker like Anthony Tolliver or Wayne Ellington with 4 on the shot clock. Love is already getting star treatment from the stripes at an early age, and this is good for the team in the broader scheme of things. But this is my subjective pet peeve about how the game should be played. It isn’t fun to watch and it should be increasingly ineffective if rule changes are enforced. *His free-throw shooting has been problematic–65 percent is unsatisfactory for a player as skilled as Williams. *Adelman should work to incorporate Thrill’s interior game with Love’s perimeter game. It’s obvious that this is where each guy has the most to offer offensively. Adelman stuck Anthony Randolph out there, after an extended, non-injury-related leave of absence the previous two games. In 11 minutes, AR15 chipped in 9 points (4-8 FG, 1-1 FT) and 5 rebounds. For various reasons, most notably that he fits in better with Rubio’s passing skills, I’d like to see Randolph take ALL of the Darko and Pekovic minutes. Sure, those guys are heavier and will defend certain players better than Randolph. But Randolph will finish plays that should be finished, he can get his shot against anybody, and he is an aggressive rebounder. Heading into tonight’s game, he was third on the team in points per 36 minutes (17.2) and second in FG% (52.0) (to be fair, Pek leads at a mighty 60.7). Randolph will have his moments when he self-combusts and needs a break. But so do Darko and Pek. Randolph is the least-bad option at center right now and the harm in giving the most-talented of the three more minutes is unknown to me. Let’s hope for a better one on Wednesday at Dallas. The champs are playing better than they were early in the season when the Wolves thumped them at Target Center.